Mad rush to the finishing line! Delta Plus - Internal frame painted! Time really flies. 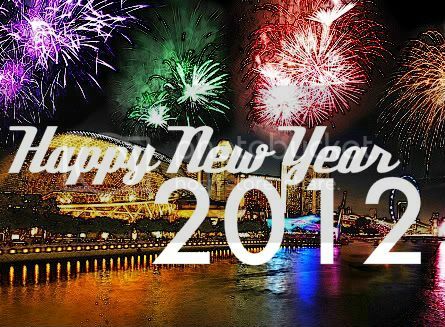 Before I know it, it's already the last day of 2011. Well it is the time for me to review my performance for the whole year. Well, aside from the everyday issues at work, I have a relatively peaceful year. I was upset when I couldn't complete my O for GBWC 2011. I felt that this guy deserves a better stage than my old dusty display case. Nevertheless, it turned out much better than I expected. 2012. This year will be the year of the "commission backlog clearance". There are a few interesting projects coming up for me and I can't wait. It's going to be a hectic year for me! But, whose complaining? lol... With my "predicament", I think that it may be time for me to stop competing. Time for the new blood to take over rather than old farts like me "holding the fort" LOL. Well, I hope you guys totally enjoy yourselves and I wish each and everyone of you out there, Happy New Year, may success follows you wherever you go. Been busy lately. 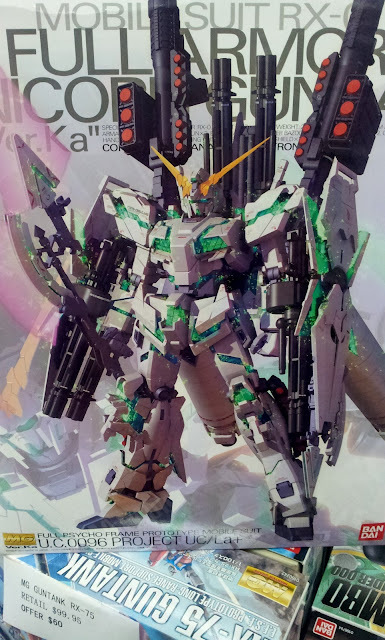 I have been building four kits simultaneously and this is probably my first attempt at an non Bandai "BD" model. 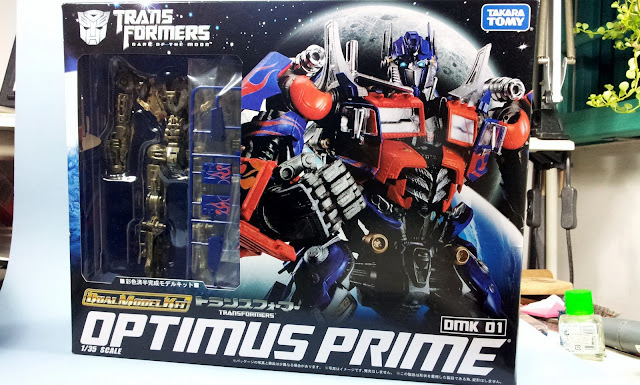 Manufactured by Takara Tomy "TT", this Dual Model Kit OP is a very detailed. 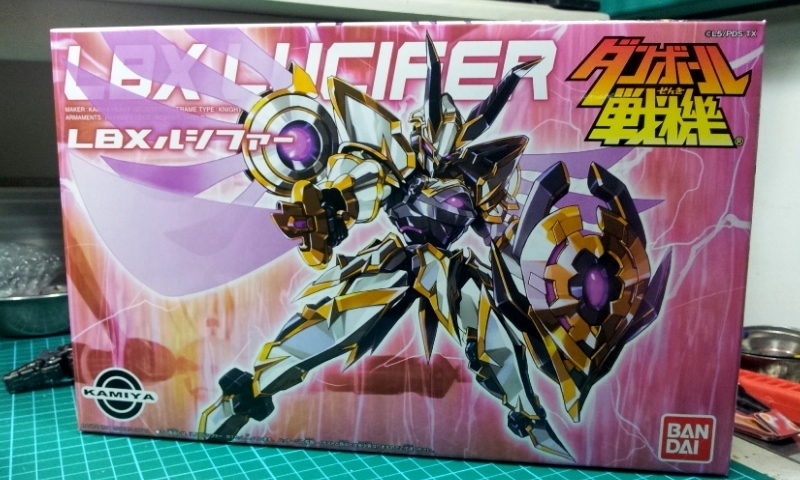 Although the skeleton has been pre-assembled, it still took me some time to assemble the whole kit. All I can say is we modelers have been pampered by "BD" a lot. 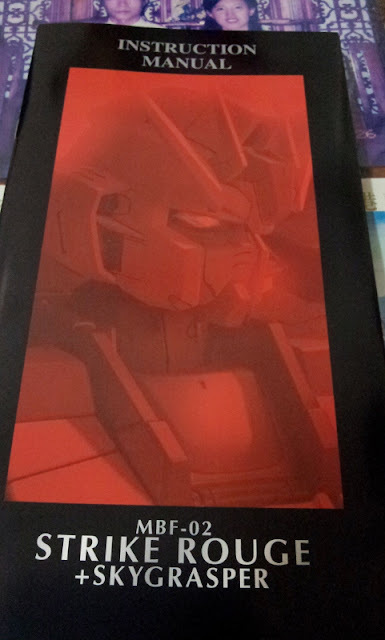 The box is about the size of FA Unicorn Gundam but weighs heavier. 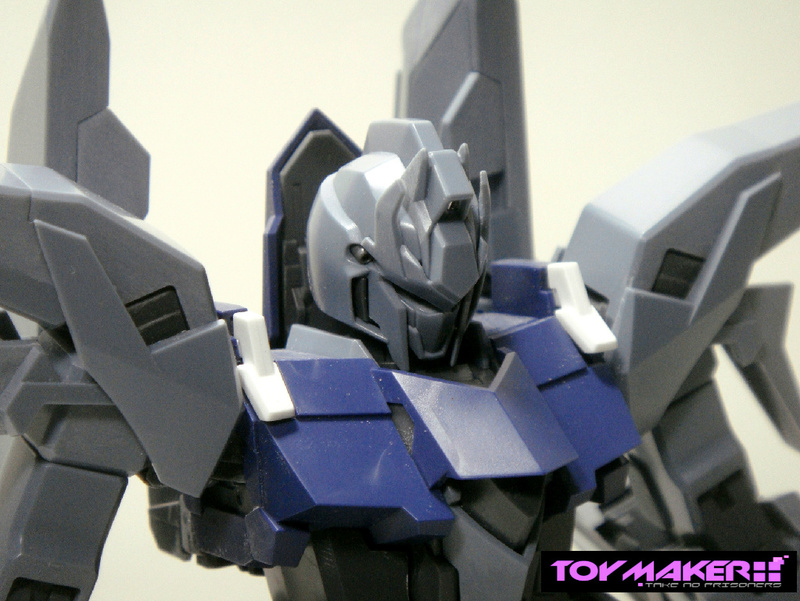 All the parts are molded in the original colours and some parts are painted as well. Heck! Even the trademark flames are printed on OP. For those who are really particular about mold lines, will have some for you to work on. I made good use of the extended holidays to build this one. A whopping 36 runners, it took me approximately 4 hours just to snap this kit. You can say it's a lot of parts to manage. As expected, nothing is done to improve the range of movement at the knees. 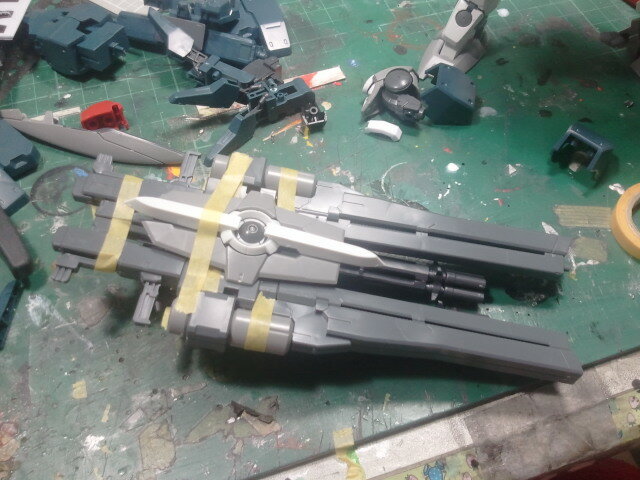 There are a few seam lines to work on especially those on the beam rifles and the propellant tanks. The additional weapons is one plus point to me. I could do with a few boxes of FA Unicorn. Somehow, I felt that the two propellant tanks are too bulky for the Unicorn. It looks like the waist will snap anytime after I attached both to the backpack. Well, for starters, let show you guys the box art, contents and the construction manual. Beware! Pictures galore! 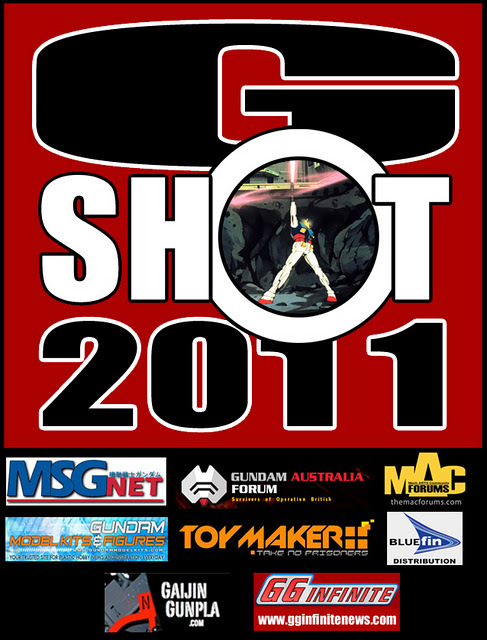 As most of you should know by now, results for GBWC 2011 are out. This year, the Grand Champion is from Malaysia, Mr Jeff Ho! Obviously his entry titled "Kshatriya IV", won the hearts of the Judges. Well, this one gets my vote too! Once again, congrats to him. 1. 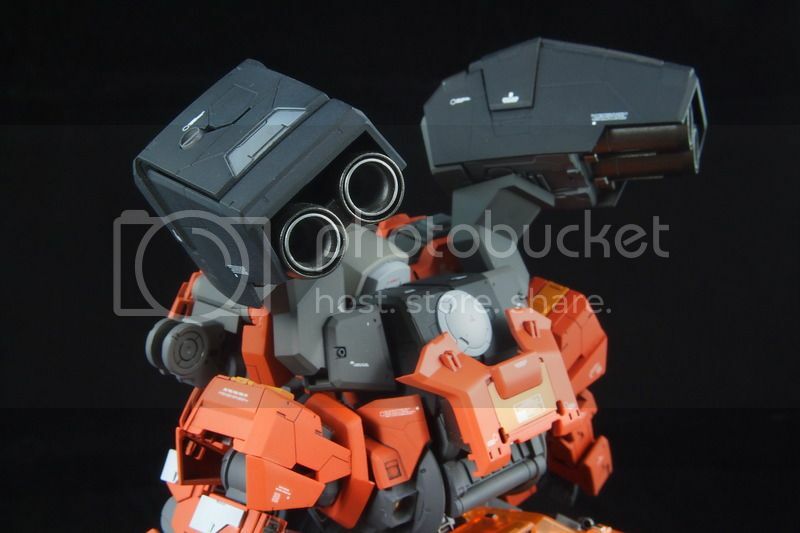 Best Gunpla Photo - A gunpla image that would 'WOW' the judges. 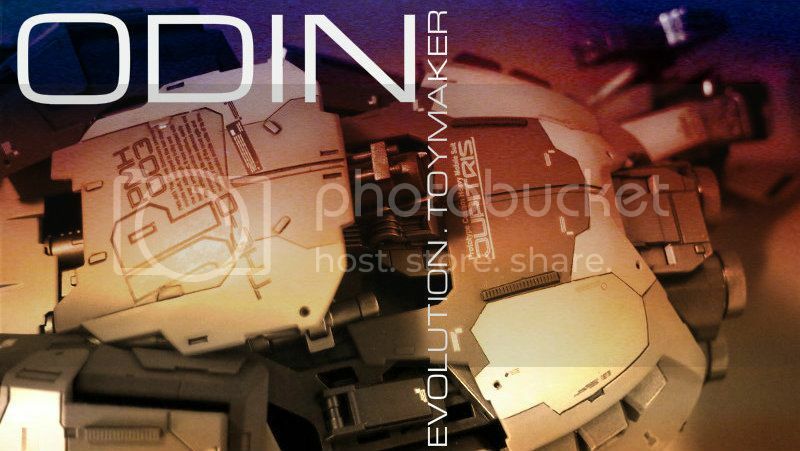 It doesn't matter whether the photo is from a diorama, customized kit or a straight build. 2. 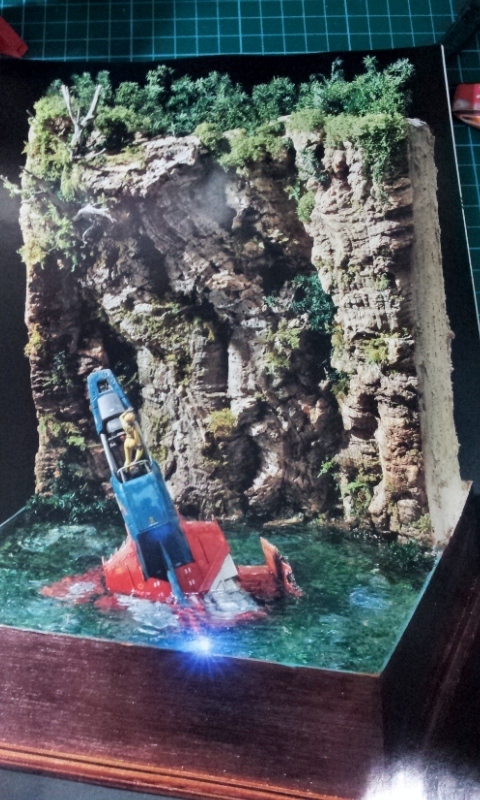 Best Diorama - An image of a diorama that tells a story, with details that show the modeler's skills. 3. 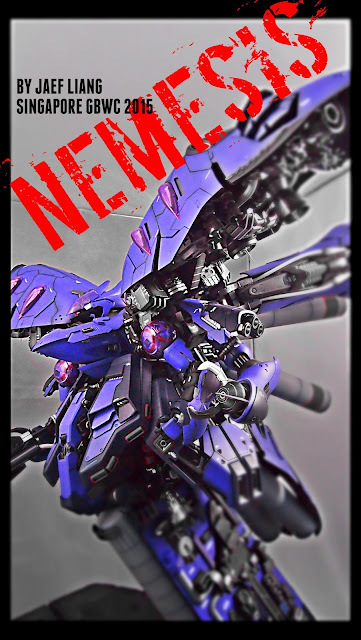 Best Customized Gunpla - An image of a suped-up gunpla. Your image needs to show us the mastery of your modelling skills, by rightfully implementing aftermarket/option parts, custom decals, pla-platings, panel lines, etc. Basically we are looking for 'The Works' that looks the best. 4. Best Paint Job - Obviously we are looking for more than just the stock color. Creativity & painting skills are what count here. There are fantastic prizes allocated for each category and I suggest you have a look. For more information of the contest, please read here. And thanks to G.G's kind invitation, I will also be involved in the judging process. So for those of you who are keen, do join in the fun and win prizes! 1/48. All I can say is it is HUGE! 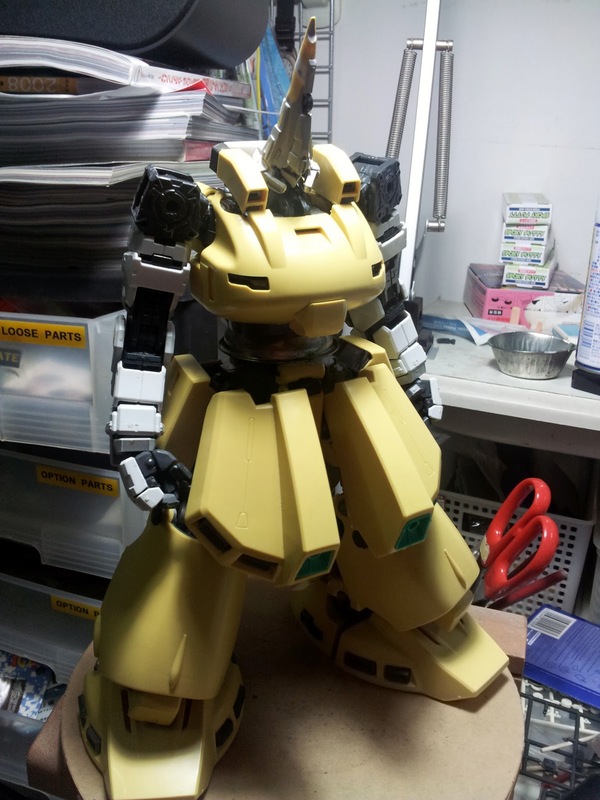 It's like a blown up 1/144 scale Gundam. With no internal skeleton, I finished snapping this under an hour. Construction is so simple, I had my son to build a few parts for me. The major seam lines are at the calves, forearms and the head. The rest can be easily tackled. 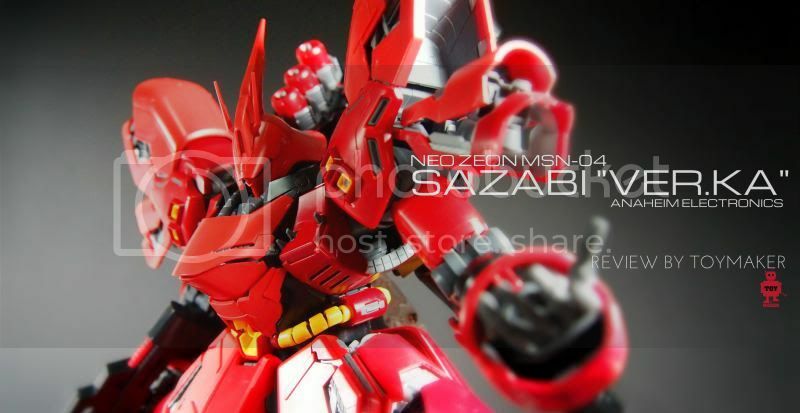 Although this is like a Non-Grade kit, the details on it are surprisingly good. As for articulation, don't expect much. 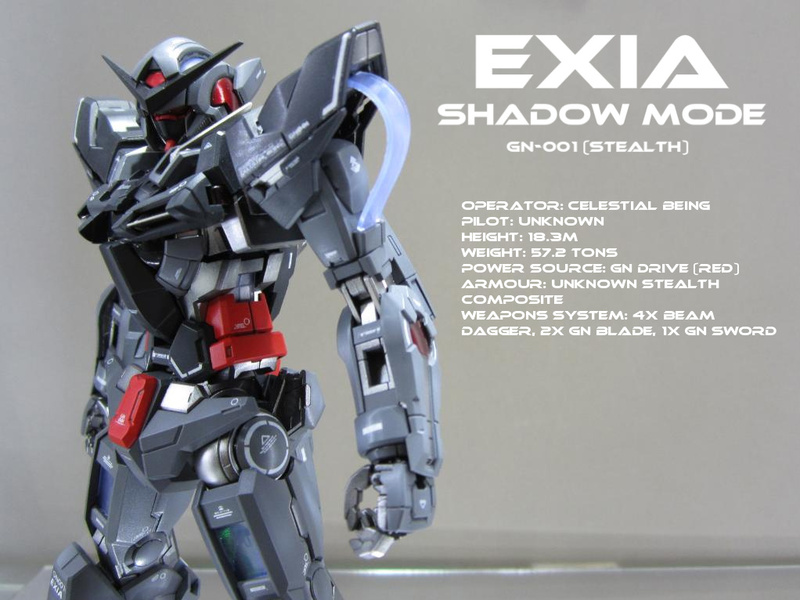 Oh, and this comes with a LED light unit (like the ones you find on the MG OO) so the chest and eyes can light up. 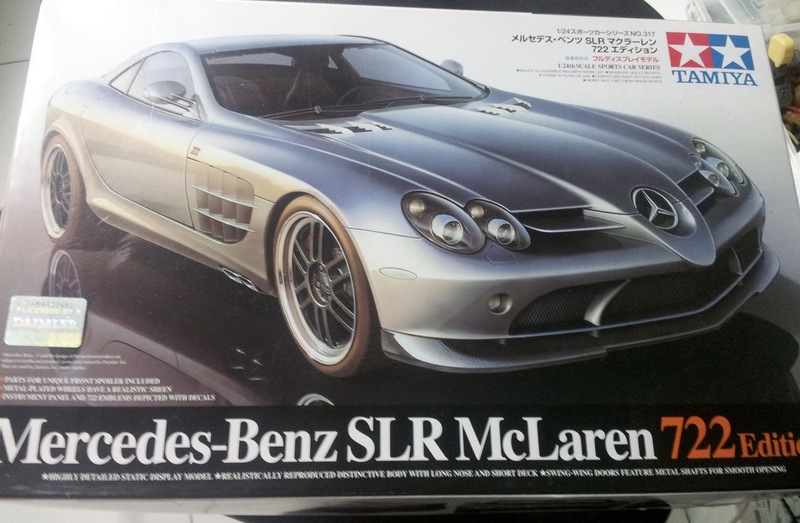 I always look forward to buying the January issue of Hobby Japan every year. This is because there will be an article on the annual All Japan "Ora Zaku" Championship in Japan. To me, this event is like the "Premier League" equivalent of all Gunpla competitions that include BAKUC, GBWC etc... This is where all the heavy weights cross swords, pitting against one other with skills, creativity and ingenuity. The works on display make me look like a silly amateur all over again. I took pictures of some entries to share with you guys. To start off, the Grand Winner goes to this entry titled "Genote". 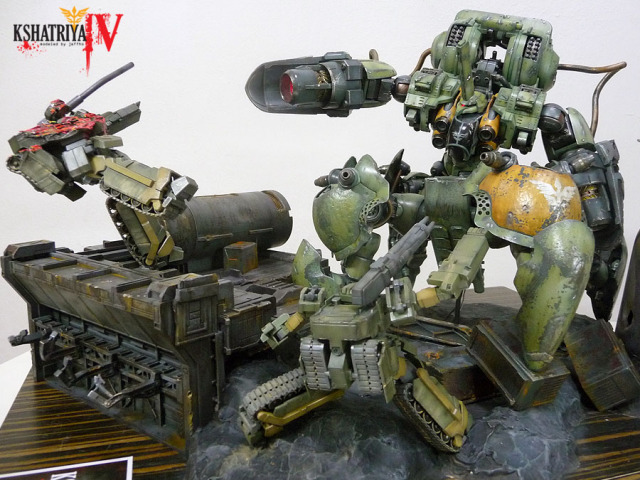 Just when I thought I have seen virtually all dioramas featuring the UCHG Corefighter, this guy came up with another whopper. Just looking at the picture is already awe-inspiring. The cliff face looks damn realistic and the placement of the subject matter and interaction with the surroundings is perfect. The author created a very captivating scene and it tells me a story. The water looks so real that for a moment, I thought it was. It is a cool move to show part of the submerged Corefighter. I decided to spend some time to work on the PG Strike last evening. No matter how many times I do this, it always look so daunting at first. So many runners and parts! Well, I have been asked to do a PG Strike together with the 3 striker systems namely launcher, sword and Aile Strikers. 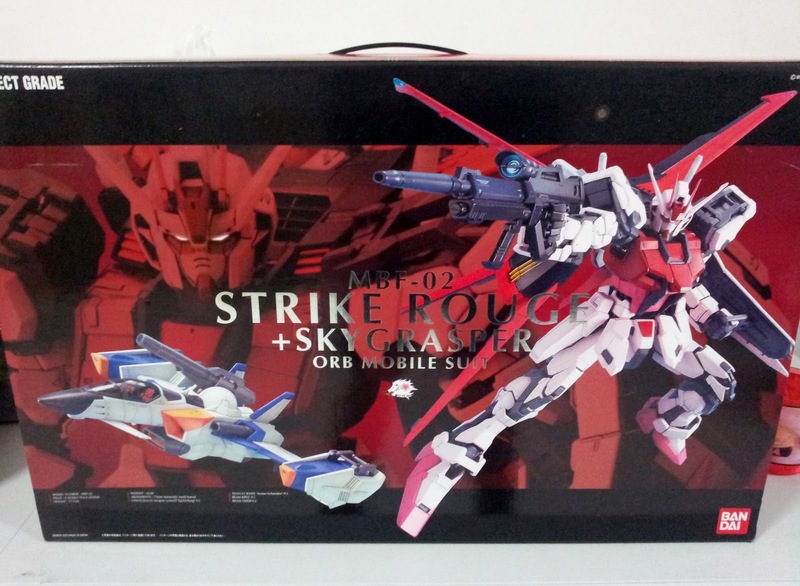 As explained earlier, I won't be simply slap on the 1/60 Non Grade Aile Striker parts on the PG Strike and call it a final product. I will probably do a little revamp and redesign the Launcher and Sword striker systems to match the complexity of the PG Strike. I will document my progress here as often as possible. I just got this in the evening and thought that I could do a little review on it. 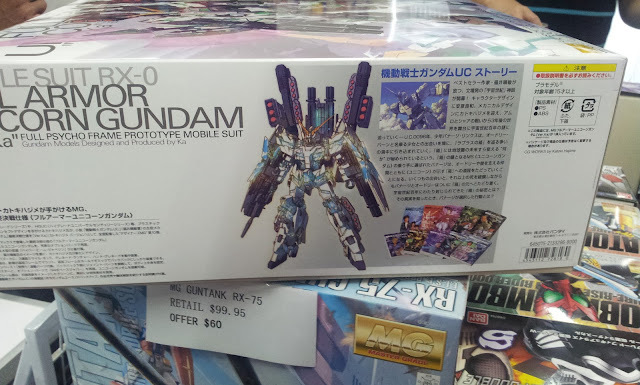 This is my second LBX model after LBX Odin. Construction is relatively simple. I have it snapped within 20 mins and I did not even use my pliers. For the past few months, I have been rushing for Gunpla Builders World Cup and been to hell and back. In the end, I still came up short. But to thank my wife and co for been so understanding during this period (I know some of you might have been murdered by your spouse), we went on a weekend getaway to Batam, Indonesia. To be frank, I thought I was not going to enjoy this trip as there are no shopping, not much activities and, no Gundams. But I was wrong. I totally enjoyed it! The sea, the breeze, the atmosphere and not to mention the local food. I gorged myself to death there. 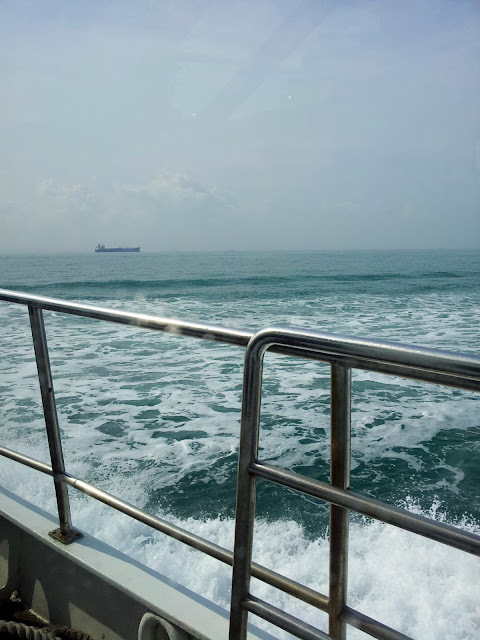 A half an hour ferry ride and another ten minutes car ride, Turi Beach Resort is the place for a short trip. At the hotel room, I kept staring out to the sea, the view was breathtaking. Everything looked so calm and serene... Ahh man ... I like it. 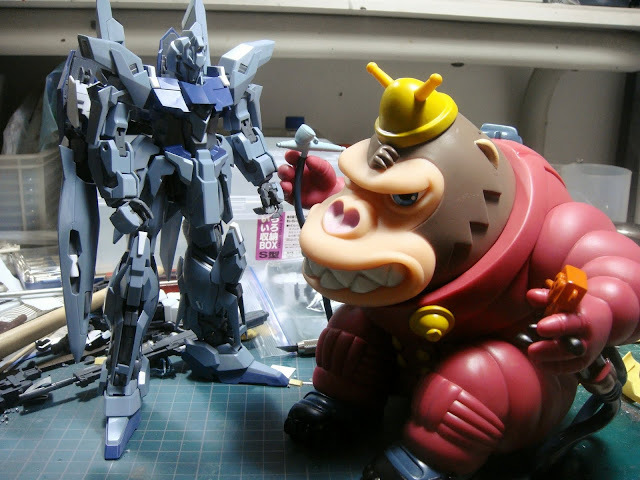 With Gunpla Builders World Cup over, it is time to get down to business. I have three outstanding commissions on hand. The plan was to create three striker systems in Perfect Grade format. I will be using the non grade 1/60 Striker set for this conversion. This will be a very interesting and challenging project for me. 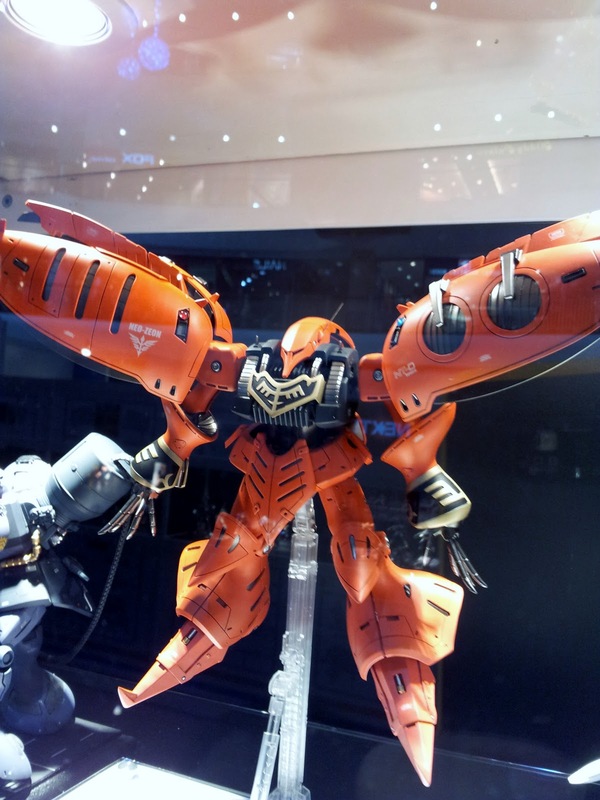 I went down to Gunpla Expo 2011 this evening to have a better look of the entries. I felt that there is a dip in standards this year. That could be because of new participants entering the fray, I did saw a lot of unfamiliar names. If this is the case, then it is a very encouraging sign. Old folks like me could call it a day and let the young generation take over. Anyway, I took some entries selectively (it was very crowded) and hope to share with you guys. I managed to downloaded all the WIP shots. I took them entirely with my Samsung Galaxy S2. This phone has never let me down so far. Order of the photos are pretty random in order. But they will probably give you an insight of my thought process throughout the whole build. I decided to created a page for all my WIPs for future works and make this a habit. Hopefully I can have a huge library of WIPs in time to come. I need to rest. Period. I have been sleeping 2-3 hours every night for the past two months. Right now, I want to give my body a break and shut out everything else. I learnt a valuable lesson than Gunpla itself today. It shook me to the core, no doubt about it. I like to tell you all a little bit more. 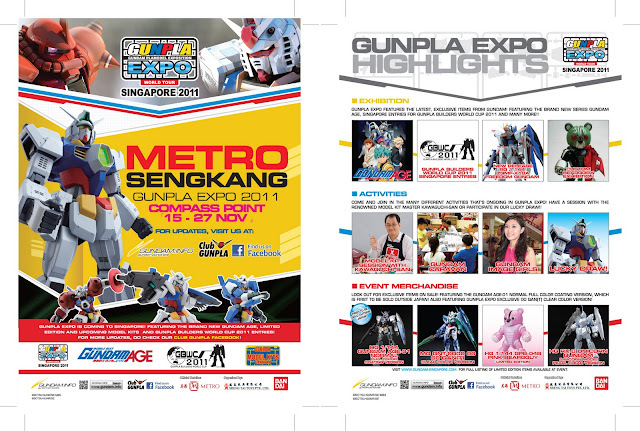 Why we work so hard for Gunpla over the years? For passion? For awards? To be frank, I gained something that outshine everything else, "friendship". The friendship I gained with all the folks at HAG/ HAW and Leon Ku especially, makes me complete. I like to say to them "we grew up together", being through tough times and HEY! we are still kicking and stronger than EVER! We have conflicts at times but nothing can derails our deep rooted brotherhood. How about the local/ overseas modelers I met along the way? Well, I am blessed. I am lucky to know a lot of friends from overseas and they are the best people I ever met. And the best part? I am still making new friends everyday! And reading this emo post by Waylander also makes me realize how important my wife is. Today is her birthday, but I basically utilized all my leave for my entry, I could not join her on her off day. Yes I am mightyly guilty but she would have none of it. She wanted me to do my best and just as happy that I raised my own benchmark. Mark my words, I am going to spend more time with her and my children more now. It is a pity that the O did not make it to GBWC. But it may eventually turned out to be a blessing in disguise. Right now, I will finish it and its BFG. Then give it a superb maintenance setup (it deserves that much) and then present to Hobby Art @ Work for display. To me, this piece has exceeded all my expectations thus far and I am very proud of it. So I will make sure all blemishes are corrected and to make it as perfect as possible. On the other hand, I am already thinking how to excel my current work and I think I still can improve even further (and throw in a few more surprises along the way). I have three interesting commissions coming up and I intend to start all at once. So expect more from me next year. Right now, my focus will be on finishing the O. On a side note, I am also happy to see that Waylander, cool guy I enjoy doing Gunpla with, making a marked improvement from last year BAKUC. Expect more from him next year. I am pretty sure of it. OK. This ain't finished. That's the bottom line. I still have tons of decals to add and I have not even finish the BFG and base. But nevertheless, I will post some pictures of it since Mr Donc has already done up his. THe purpose of this build is to give the O an overhaul. I guess by now you guys have seen enough of those monstrous versions. So I have decided on the onset to do a "slim" version of the O. Of course there are not a single reference I can find out there. I tried several designs but could not find a suitable frame for it. And it so happened that I was fiddling with a PG Strike that I realized that its frame suits my idea perfectly! Well, by then it's already mid September and I have not enough time to work on something so massive. Well of course, this build was done in as a FACE-OFF with DC23. He has done a really impressive interpretation of the O complete with a nice diorama. Without further delay, I present to you my unfinished Master The O. Please forgive me for not completing this in time. I will finish a maintenance structure and post more WIPs soon. 1. 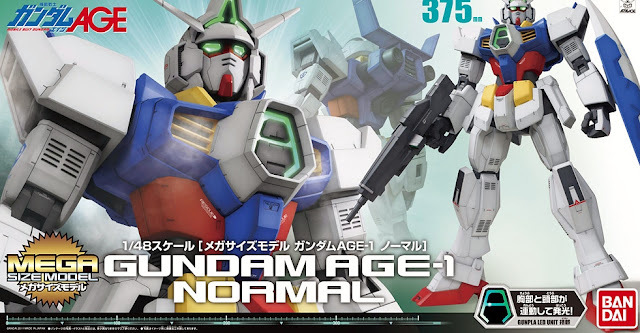 Introduction of the brand new series, Gundam Age. 2. Gunpla Builders World Cup 2011 (Singapore) entries on display. 3. Release of the Real Grade (RG) Freedom Gundam ( a must buy for me). 4. 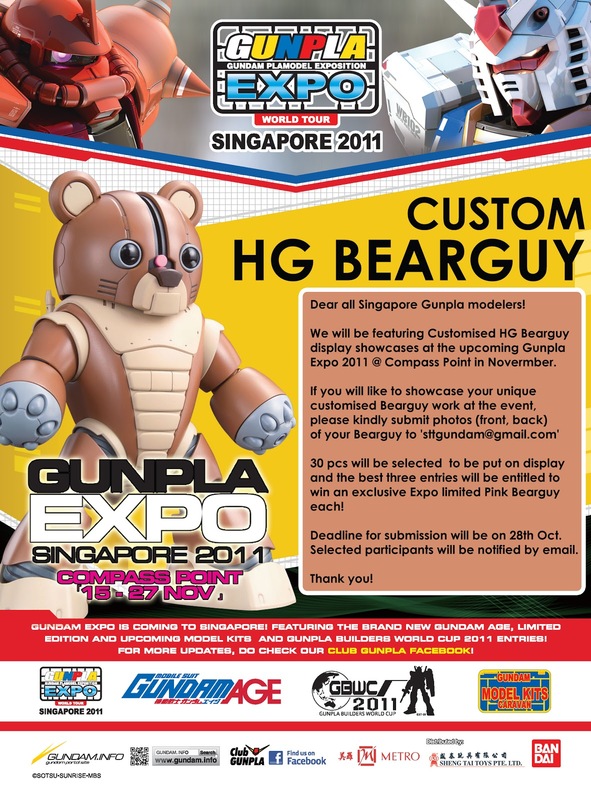 Custom Bearguy exhibition, this will be fun to watch. 5. Model kit session with Mr Kawaguchi. 7. Gundam Image Girls (not interested). And for your information, Shengtai, the local distributors for Gunpla products is looking for promoters for this event. If you are interested, please contact Sheng Tai Toys at 6743-3636. So, see you guys at Sengkang Compass Point! 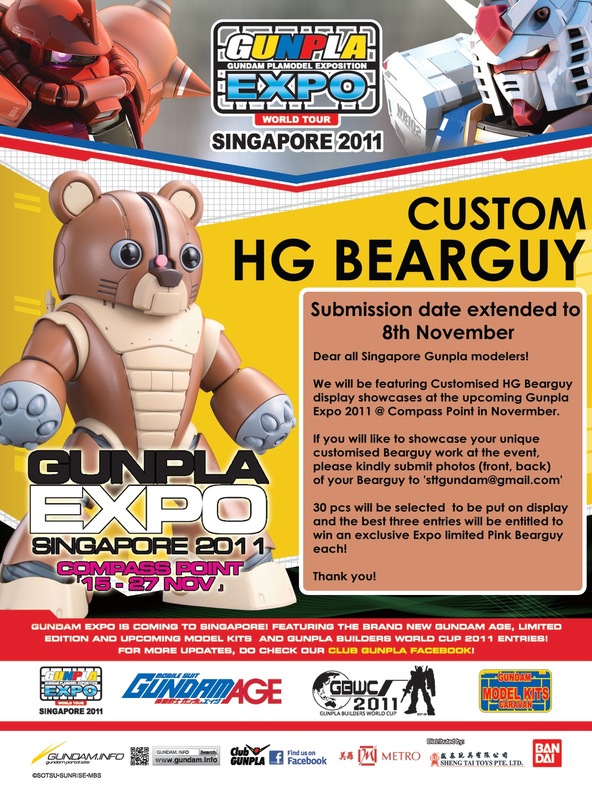 And for those who are participating in GBWC2011 and Custom Bearguy, do take note that photo submission has been extended to 8 November 2011. The finishing line is in sight! 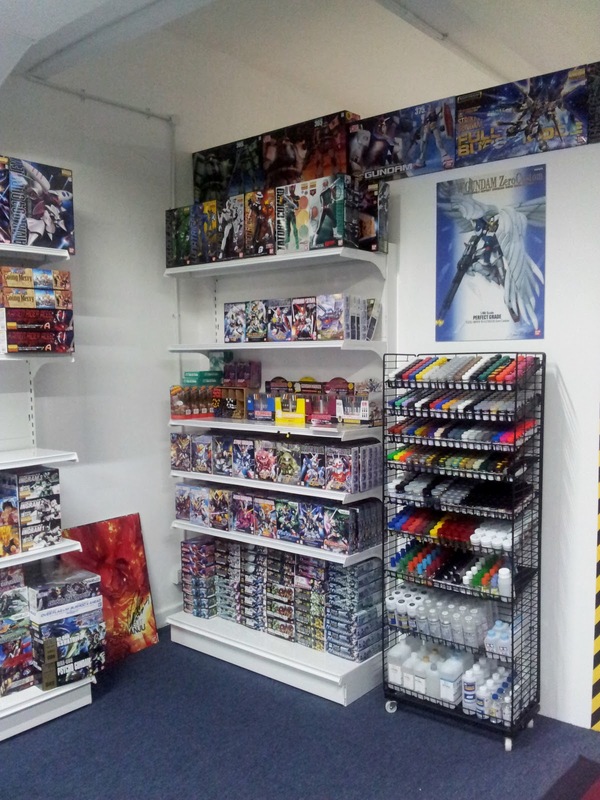 As you can see, most of the products are up on the shelves. What a sight! 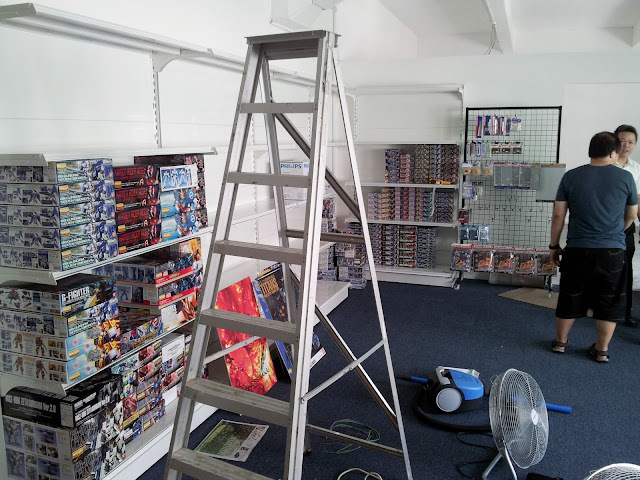 With the retail side done, the guys at HAG can concentrate on the work area for students/ modelers. I am really looking forward to this. 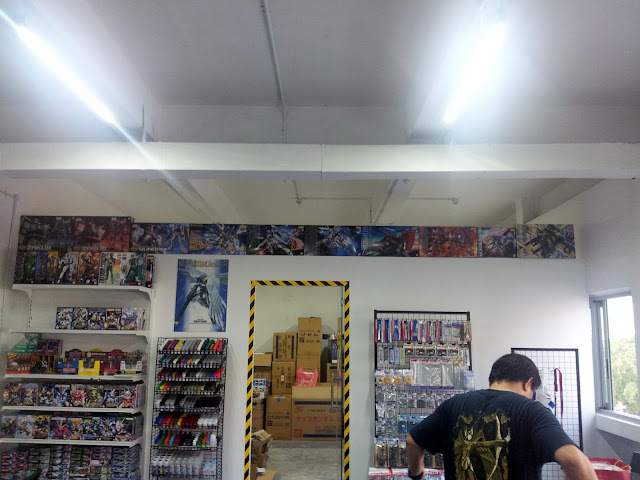 Finally a place in Singapore where local Gunpla/ Sci-Fi modelers can learn and exchange ideas, and most importantly, HAG hopes to foster Gunpla culture here and encourage and inspire people to take up this hobby. Modeling lessons are also conducted at the new place by our big guy,Sam. Now, with more space, Leon, Eric and I will be playing our roles as mentors to the younger modelers. We are exploring the viability of lessons/ tutorials on specific/ special techniques on top of the basic courses by Sam. I think it is time to push the next generation of modelers up the ranks, don't you think so? Oh, did I tell you about a lounge area for members/ visitors to chill out? Yes, HAG has set up an area just for that. We will also make reading materials/ reference books available. As most of you may be aware by now that Hobby Art @ Work "HAW" will launch on 18 October 2011, next Tuesday. For that day, the first three customers to spend S$188, S$88 and S$48 respectively will be entitled to free memberships worth just as much. Take note that this only applies to the first three customers to spend the respective amounts at HAW. 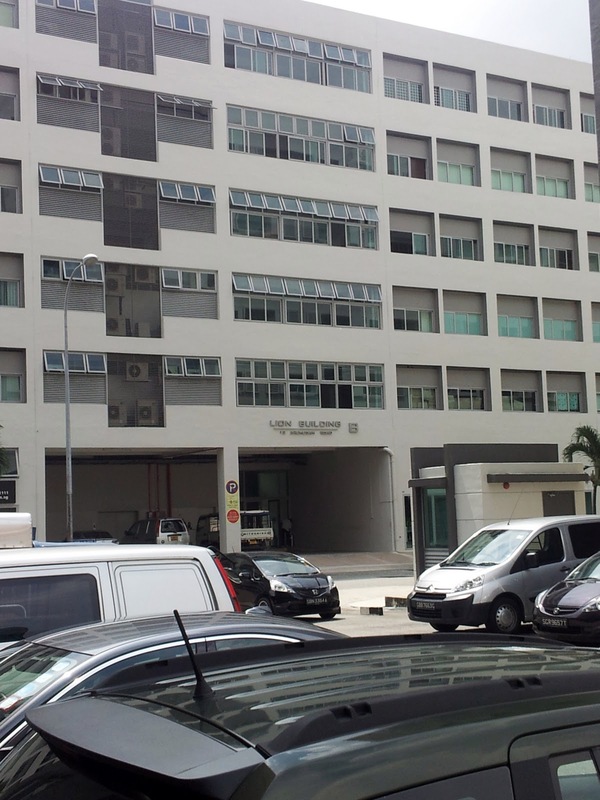 And for a limited period, the six-lesson basic gunpla course offered at HAW will be at S$200 dollars instead of the usual S$250. HAW Hanger is still a Work-In-Progress! I drop by the workshop today. 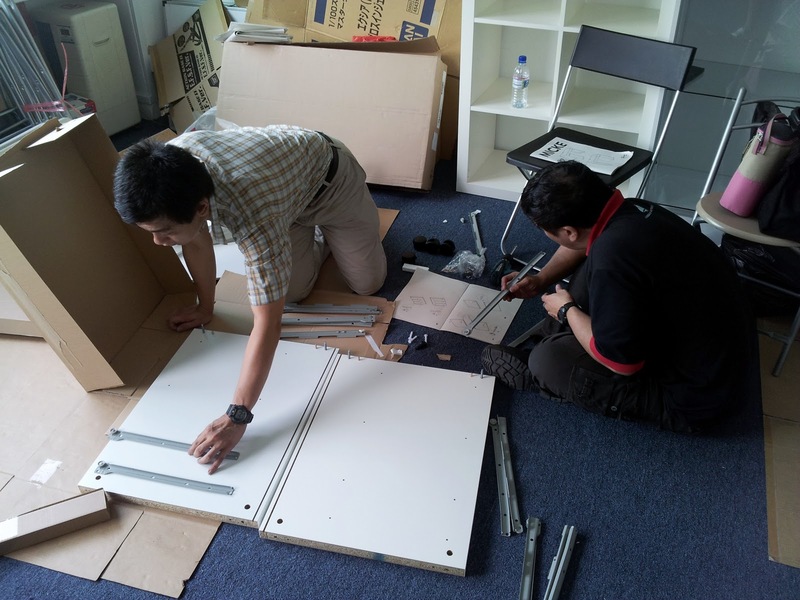 The guys were busily assembling furniture. Now the workshop is beginning to take shape. I am looking towards the days when I can work on my projects here. Hobby Art @ Work will begin operating on the 18th of October 2011. This is next Tuesday! However the official launch is scheduled on the 5th of November. Take note guys! I will be posting more information on the shop this week so keep a lookout for it. Shelves displaying the stocks. Here is definitely more spacious compared to Sunshine Plaza. A lot of standing room for people. Listen up Bearguy lovers! I just receive news that November's Gunpla Expo @ Compass Point, Singapore will be featuring customized Bearguys at the event! This is the chance for you to have your customized bearguy displayed at the event! All you need to do is to take front and rear photos of your kit and submit to 'sttgundam@gmail.com' by 28 October 2011. 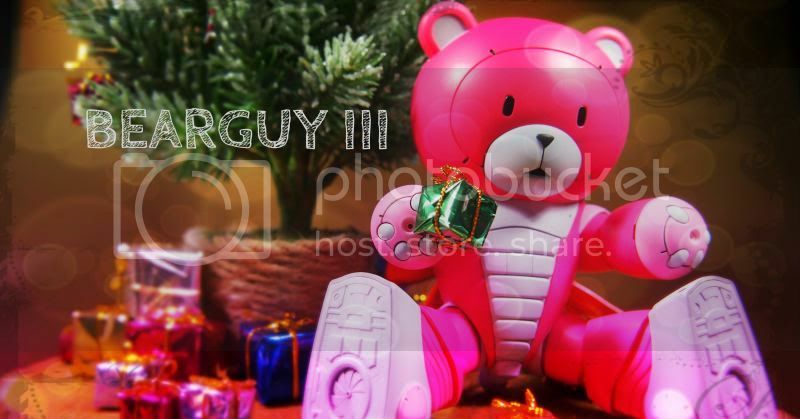 30 entries will be selected and 3 best entries will get a exclusive expo limited edition Pink Bearguy! Please refer to the poster below for more information. If you guys are not sure about customizing Bearguys, this will give you a hint. HAG organized a bearguy groupbuild a few months ago and it was a blast! So I suggest to guys to get cracking. Time is of the essence! 2002 was the year I discovered Hobby Art Gallery (HAG). 10 years on, they are still going strong and if not, even stronger than before! I always have a special place for HAG as the folks there played a very important role in my hobby. But I leave this story for another post at another day as I have very exciting news to share with you guys. Yes! HAG ver.2 is going coming! I always believe that this day will come and not a day too soon! With bigger space, they can finally set up a workshop. I always dream of a place where I can work on my models with the rest of the guys, do demos, set up focus groups on Gunpla etc. All of a sudden, Gunpla seems to be even more exciting than before. Expect more things to come in the next few weeks. I will have more details of HOBBY ART @ WORK very soon. Meantime, thought I show you some pictures of HAG's "WIP". Today is my mum's death anniversary. I woke up early as my family were planning to pray at the temple. I looked out of the window and the weather, gloomy, just like last year. It's certainly a reflection of my mood. By the time I reached the temple, it was raining cats and dogs. Standing in the rain, I looked up at the heavens expecting an answer. "Why?" I asked. Why make me go through all this? The wind felt like ice, so cold it hurts. No answer, nothing. Just the wind howling. It is so unreal. Like a sad movie that keeps on playing, and I am in it. Four years. Time has done little to heal the pain. I looked at my sister and I know that she is going through the same thing. Both of us want some answers, maybe some comfort or maybe ,just want to be with her again. It's good to be caught in the rain. At least she can't see my tears. I noticed that her eyes were red too. I have being gunning for this one before it's release. So when I got hold of it, all other projects were dropped temporarily to do this. Basically an OOB work, I decided to brush up my metallic finishing. All parts were painted silver with gloss black as base. And I applied different shades of red for various parts. I thought this is a interesting colour scheme and very well executed. Everyone love their Gundams to be in stealth mode these days. For more pictures, please head over to his blog at MG Exia Shadow Mode. 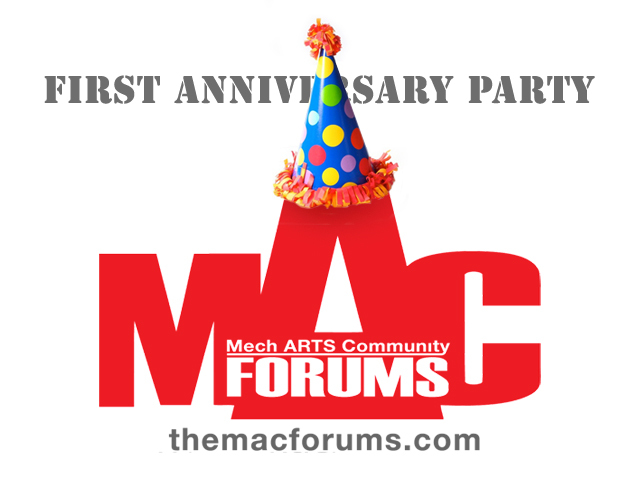 Ever since I decided to attend MAC First Anniversary Party, I have been looking forward to it. I always love to meet fellow Gunpla modelers from overseas. This time, I decided to grab Benjamin, Yihui and Edmund with me to meet our friends from the Philippines. However the day I was supposed to leave, I have been told that my Godmother has passed away. I attended the wake and paid my respects before leaving for Philippines on the same day. I was feeling down but was determined not to let it get to me. I felt that I lost another mum that day. The first thing I had to face when we touched down was the traffic jam. We were stuck in slow moving traffic for almost three hours. But that gave us more time to talk to chat! It was pretty enjoyable even though we were tired. The next day, we meet up with the rest of Mech Arts members before proceeding to Don's place. There was a HUGE crowd. I find it very encouraging as I see a lot of youngsters among us. The community here will go a long way! I am overwhelmed by the warm welcome and also touched by the gifts from DC23 and gang. All these means a lot to me. And starting this hobby is beginning to look like the best decision I ever made. Hopefully, I will be able to meet the rest of the overseas members in the future. Till then, keep building my friends! 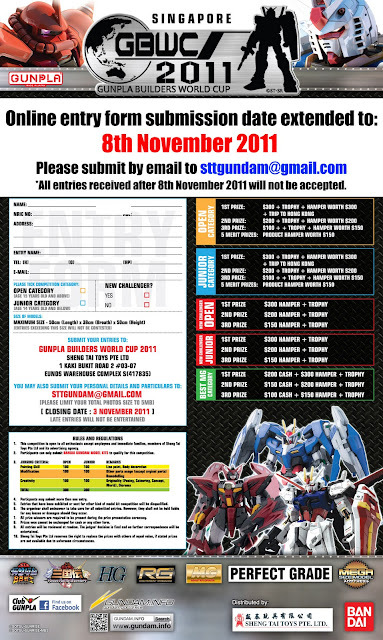 In case some of you might be wondering what you saw on my previous post "Questions to be answered post", I managed to salvage some pictures of a project I abandoned when it was announced that our mid year competition was integrated into Gunpla Builders World Cup 2011. It was supposed to be a GN-X variation. A targeting system attached to its head and equipped with a sniper weapon. But with the O face off with DC23 looming and the competition integration, I have but no choice to forgo this one. Well, enough of excuses, here are the only few pictures I found in my camera. Unfortunately, I reformatted my SD card and most of the photos were erased. So this is it, tomorrow the team of Poison Monkeys will be going to Philippines for the first MAC Anniversary party! Izakku, Waylander, Edmund (Hobbymate) and me will be meeting the team at MAC forums and the man himself, DC23! Nothing beats meeting face-to-face, we have lots of ideas and techniques to discuss, share and learn together! This is going to be a blast! Anyway, I did not prime but applied gloss black on bare plastic. Then I use Gaiacolour 020 Gunmetal on it. 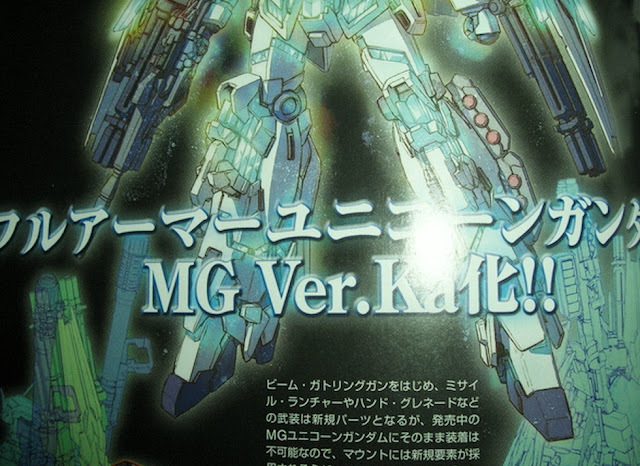 Well, this is hardly surprising, Master Grade Full Armored Unicorn. I was wondering what took them so long. This will definitely be a hot item. Now question is, when will it be released? So far, those released are Unicorn Gundam Ver Ka, a Normal Unicorn Gundam and another one with MS Cage and now, this. 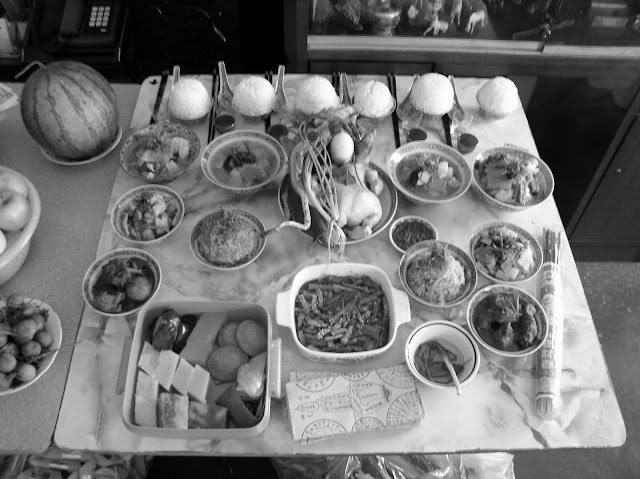 You know, when I was younger, I used to dread the seventh month which is also known to many as the Ghost Festival. This festival is celebrated by all Chinese in many countries. It is widely believed that ghosts and spirits are allowed to roam freely for this month. The deceased will visit the living. During this month, Hell money and food among other stuff were offered to these wandering spirits. Chinese operas and "Getais" (like a concert) will be performed to entertain these spirits. 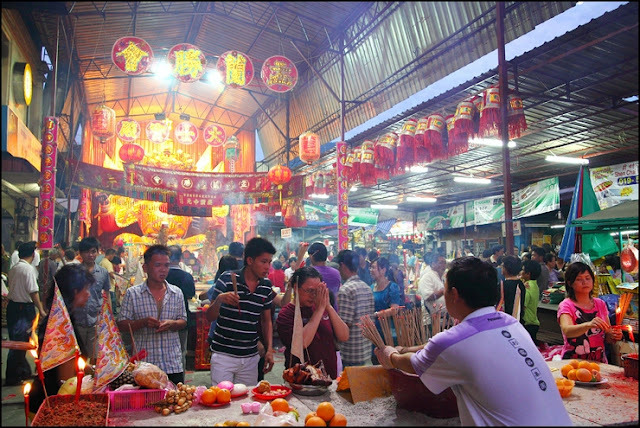 Chinese temples will be abuzz with activities. I could still remember my mum would diligently preparing the offerings before the festival and gave my a lecture on what not to do during this month. Things like stepping on offering on pavements, spitting, swearing is a no-go. The list goes on. To me, this month means I had to be extra careful when I am out. The usual route you take going home suddenly looked sinister. Shadows start to play tricks on your eyes. It's like the situation is constantly tingling with anticipation and adventure. Yup that's me when I was very young. 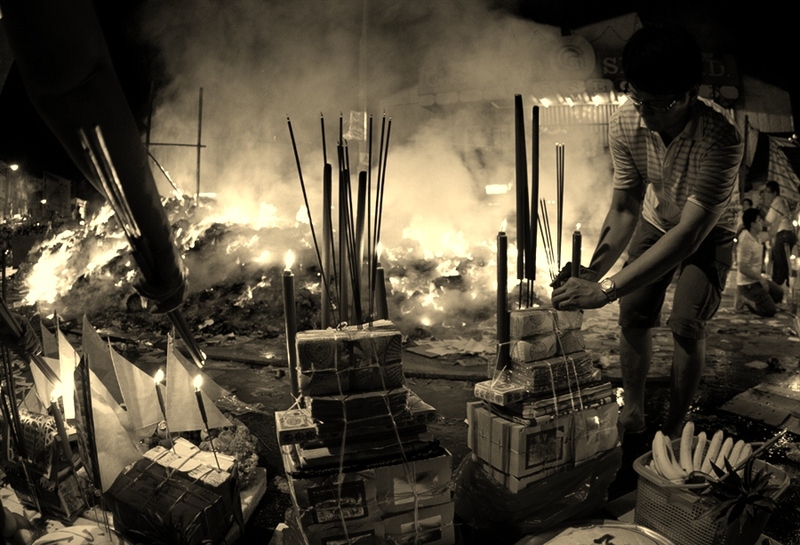 And with incense and joss paper burning, the whole neighborhood looks gloomy and eerie (fun). Fast forward 15 years to today, things have changed. Our society becomes more affluent and such customs are not practiced anymore. Burning joss paper and other related customs are frown upon. It saddens me that She is not with me anymore. I really miss her. Crazy as it sounds, but if this is the month she can visit me, I sincerely hope she does. I wish that I can see her again. Four years since she passed on, and there is not a single day I am not thinking of her, tears are meaningless to me now. If you ask me, I would probably do anything just to see her one more time. Meeting a ghost? Nothing much to worry really. After all, the living can cause more harm than the dead... .
Our newest member, Gorilla Jack!!! 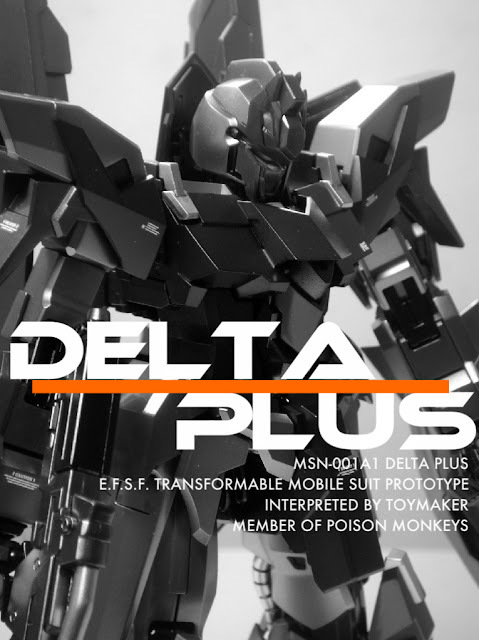 Spent the weekend assembling and sanding Delta Plus. I fiddled with it for awhile and so far, I am impressed. The design is slick and details are pretty good too. I especially like the head. Like the other transformable Gundams like Zeta Gundam and Zeta Plus, there is an issue about stability. This is due to the folding mechanism at the hips that allows transformation. Hence, it tends to wobble at that point. Other than that, this kit is a must buy to me. Finally I got my hands on this! Taking a break from my main project, I'm planning to do a quick build for this week. Think I will go for a metallic colour scheme for Delta Plus. A test of speed!